He starts from the premise that the modern size 185/80R13 is clearly the most appropriate current radial replacement for both sizes of the original 13-inch Ponton tires. Well, yes and no. Terry and I had, admittedly, somewhat different goals. His apparently was to identify the most suitable radial tire, presumably for reasons of safety. Mine was to find a modern radial tire available today that most closely corresponds to the measurement characteristics of the original tires. My objectives were (a) to keep the original 13-inch wheels, (b) to come as close as possible to the revolutions per mile (RpM) (or revolutions per kilometer (RpK)) of the original tires, and (c) to have the spare slip easily into the spare tire well in the trunk. I was also looking for comparable aspects, and that involves tire diameter and section width. That includes tire height and aesthetics inside the fender well and with respect to the overall appearance lines of the vehicle. Cost too was important. Conventional wisdom generally is that the modern 185/80R13 size is the best radial tire equivalent for the original tires on all Mercedes-Benz Ponton models. I found, contrarily, that one might also consider another size for the Type 180, 190, and 219 Ponton sedans. The following table presents the original tire and the modern equivalents. The overlaps occur because of the measured differences among modern tire brands and because of physical differences between lines within the same manufacturer. So, "What modern tire size should I buy? ", one rightfully asks. Give a simple answer and cut the hedging! The answer is a straight-from-the shoulder evasion: It depends. On what? If you can handle the prolixity, read the whole piece below. If not, the above table will suffice. Physical measurements may be necessary on or off the car. In reading the discussion below, one needs to recognize that the results reflect an inexact reality. Although we start from some ostensibly known data, inconsistencies or mistakes in published information, rounding errors, differences among manufacturers, differences even with different production runs can all introduce complications. Not to mention the possibility of my own analytical errors. This means 13-inch wheels and either 6.4 inches or 6.7 inches section width. At the time, section widths were expressed in inches. Expressed in modern terms the 6.40 tire would be 163/83-13. The 6.70 tire would be 170/83-13. The 6.40 tire would be 163/83-15. Original Ponton tires were narrow by modern radial tire comparisons. During early 1960s Mercedes-Benz officially substituted the size 7.25-13 tire for the original 6.70-13 size on the 220S and 220SE Pontons. There was an optional 6.40-15 tire as well, available on Pontons destined for selected markets. Finally, for very special purposes optional 6.70--14 and 6.40--14 tires seem to have been available, although nothing today is known about their use. The article will discuss modern radial size categories. The 185/80R13 category, for example, means: 185 mm maximum section width, 80 minimum aspect ratio, 13 inches wheel rim. For a good explication of what all this means see: http://www.tirerack.com/tires/tiretech/techpage.jsp?techid=7 Application of these designations for Ponton purposes is seen below. The Great Tire Quest is not new. In one of The Star Reprint series (No. 2 @ 39) it states that modern radial sizes 185/80-13 or 175/80R13 are the most suitable. In an article on p. 11 in the November/December 1995 Star, contrarily, the late Frank King states that for the 6.70-13 tire the best equivalent is 195/70R13, and for the 6.40-13 tire the equivalent is 185/70R13. Note also the considerable treatment of this issue by The International 190SL Group. Opinions thus vary widely. The departure point is the tire sections, 40-0/2 and 40-0/3, of the Service Manual Model 190 (SM-1207-000). One should have it at hand when reading the discussion that follows. The effective dynamic radius is determined by dividing the distance traveled per revolution of the wheel at a speed of 60 km/h by 2 π. ...[T]he tire pressure must be carrying the maximum permissible load and must be inflated to the specified air pressure. This is approximately 35 MPH. It means that the reference point is at moderate speed, fully inflated, and at the vehicles maximum permitted load. The significance of this is shown below, including the tread squirm factor in Section IX. See what happens with the original 6.40-13 tire. Section 40-0/3 of the 190 Service Manual lists 299 mm as the effective dynamic radius at 35 MPH. Double that to obtain the effective dynamic diameter: 598 mm. Convert this to inches: 598 25.4 = 23.54. Thus the calculated diameter of this tire at moderate speed is 23.54 inches. Important, though, is the fact that the 7.25-13 tire did become officially standardized for the 220S and 220SE Pontons, probably in the early 1960s. The 7.25 means the section width in inches. It converts to 184 mm. (Hence a modern 185 series radial becomes very much officially suitable.) Unfortunately, for the 7.25-13 tire neither the TDM nor the Service Manual provides any technical specifications like effective dynamic radius. 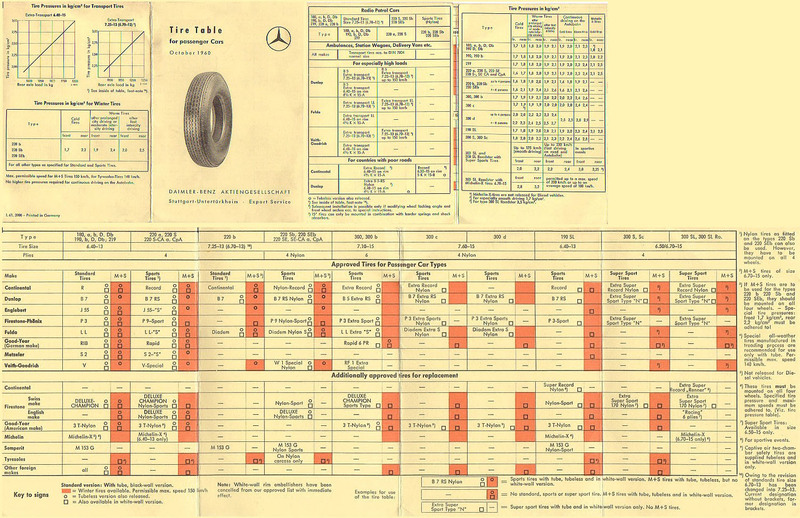 One cannot, therefore, determine RpMs according to Mercedes-Benz norms from published Mercedes-Benz data. I could not find any technical data anywhere else either. If anyone has hard information, please let me know so I can make necessary changes. I was unable to locate any information about the 6.70--14 and 6.40--14 sizes beyond their mention in sections 40--0/2 and 40--0/3 in the print version of the 190 Service Manual. Technical Data Manuals (TDM) of various dates, for example, do not mention these sizes. Various options lists do not mention them either. Nowhere did I find reference to 14-inch wheels on which the 14-inch tires would have been mounted. After considerable discussion by the International Ponton Owners Group (IPOG) no one reported ever having seen or heard of these tires sizes on Pontons. Might there have been misprints in the printed 190 Service Manual? The way two different 14-inch tires were shown in the service manual led me to conclude that they were not misprints. They represent something real, in my view. I was, however, stymied in my quest for further information. By calculation based on the data in the Service Manual the optional 6.40-15 tire revolved about 786 times each mile at moderate speed, according to Mercedes-Benz published norms. I did not have one available for ground truthing. The aspect is the ratio of the width of the tire at the widest point on the casing (not the tread footprint) to the distance from the wheel hole to the top of the tire. In period pictures some tires of the 1950s look quite tall on the cars. Tires with wide white walls supplied originally to some Pontons exacerbated this appearance. An old Firestone technical manual states that the Ponton tires had aspects on the order of 93 to 95. A correspondent from Britain said the same thing about Pontons delivered in the United Kingdom. I discovered inconsistent and conflicting information when I explored the aspect issue. As is my wont, I began to dig. Subtract the wheel rim size (13 inches)  from the diameter and divide by 2. For the 6.40-13 tire this is: 23.54 13 2 = 5.27. That is the distance from the edge of the rim hole to the top of the tire on a plane with the center point of the tread. The stated section width is 6.40 inches. Thus, 5.27 6.4 = 0.823. That is the ratio. The nominal aspect of the original 6.40-13 tire was 82. The same procedure reveals the ratio for the original 6.70-13 tire was 0.834. The nominal aspect of the original 6.70-13 tire was thus 83. Again following the same procedure based on the data in the Service Manual, except using 15 inches for the wheel, the ratio for the optional 6.40-15 tire was 0.833. The nominal aspect of this original tire was 83. For that to be the case, however, the tire had to be taller than the 6.40-13 tire by slightly over two inches, and it had to be taller than the 6.70-13 tire by about 1.5 inches. That makes sense because 15-inch tires were fitted to cars requiring higher clearance from the ground. Recall the size 7.25-13 tire indicated in the 1960 TDM reprint. Its calculated aspect ratio is 77. That assumes its circumference was the same as the 6.70-13 tires circumference. To reach an aspect of 83 the 7.25-inch tire would have been nine-percent taller than the 6.70-13 tire it replaced. That, in turn, would have had a nine-percent effect on the RpM and the speedometer/odometer. Compared to the 6.70-13 tire, the 7.25-13 successor tire either (1) was taller or (2) had a lesser aspect ratio. Unfortunately there is no information about the nominal data for the 7.25-13 successor tire, so I cannot determine which was the case. Photo 1. Those tires do look tall! It seems to be an illusory effect. I elected to retain the original 13-inch wheel size on my 1959 cabrio 220S. I knew that some Ponton owners, particularly 190SL owners, have converted to 14-inch tires. Apparently there is a 14-inch tire size that matches the original Ponton 6.40-13 tire RpM almost exactly. Sometimes 190SL owners want to reduce the engine RpM at high speed, and a 14-inch tire helps do that. Some Ponton sedan owners have reported success and better riding and/or handling by changing to 14-inch wheels. I confined my investigation to 13-inch tires. I wanted the spare tire to be the same size as the four on the ground. Also I preferred that the spare fit easily into the spare tire well in the trunk without stuffing. My existing spare was an old 185/80R13 Firestone cheapie radial that I had to force into the well because its true section width was too great. I did not want the spare lying flat on the trunk floor. I also wanted to be as close to the original aspect ratio as possible. That focused me on 13-inch radials with their nominal 80 aspect ratio. By definition 14-inch tires that fit on a Ponton would have had a lower aspect ratio to match the RpM figure of the original tires. Finally, having a cabrio I wanted white walls, wide if possible. My car was wearing Coker 650-13 cross-ply tires with 2.25-inch white walls. They did look good. I was willing, though, to compromise on the white wall width if necessary. That proved to be so. Cost was a consideration too. The Coker cross-ply tires on my car appeared to be in good condition, although they were quite old hence potentially dangerous. My choice at the time was between getting a fifth Coker for the spare or converting all five to new radials. The Cokers steered with great difficulty compared with modern radials, but that must have been similar to the way the original cross-ply tires behaved. How one forgets! A new Coker was well upwards of $100 plus tube, shipping, and mounting/balancing. Today Coker Tire has a couple of other wide white wall choices that are rather pricier, well upwards of $160. Available radials in relevant sizes can be much less expensive, but there is a wide price range among brands. In addition to the RpM number stated in tire manufacturers literature, there are other ways to determine the true RpM of a tire. Knowing the circumference of an unmounted tire will not reveal the correct RpM figure when a tire is in motion at moderate speed. One must take into account the squirm factor. The tread squirm means that the tread slips some on the pavement as the car moves, so the total travel distance is slightly reduced. As the tire tread is deformed to be flat against the ground, the outermost part of the tread is compressed slightly, becoming shortened to the same length as the steel belt over the length of the area. This accounts for the slightly reduced actual travel distance relative to a theoretical distance derived from the tires measured or calculated circumference. I have calculated the difference to be on the order of three percent, depending on the brand and model of tire. As tread meets the pavement, it squirms and contracts slightly. What this means is that the dynamic RpM of the tire will be slightly (roughly three percent) greater than the calculated number based on an unmounted tire. There are three ways to determine this more realistic RpM number. (1) Mark off a distance of 52 feet 9-5/8 inches on flat pavement. That is 1/100th of a mile. Park the car on one line. Mark the tire sidewall straight down. Then drive the car to the next line. Have a helper count the wheel revolutions. Multiply by 100. For example, if the tire makes 800 RpM, it will do 8.0 turns in 1/100th mile. When counting tire rotations over 1/100th mile, an error of percent would be .04 turns, which is nearly 15 degrees of rotation. One can readily estimate the final angle of rotation closer than that, so it is hard to miss by more than .05 percent. This is fairly accurate and accommodates the tread squirm factor. (2) Calculate the static RpM of a tire, mounted on the rim but off the car, by measuring the circumference or diameter. Then add three percent of that number to arrive at a very good approximation of true RpM. Three percent is a good estimate, based on average tire data published by several manufacturers. (3) Simply accept the tire manufacturers statement of RpM, if provided in its literature. I finally concluded that I could make only a partially informed, choice among brands based on technical data published by the manufacturers. What other considerations would I have? Price would be important, of course, but so would length of tire life. What about quality? What about safety? What about appearance? At first blush we tend to think that our beloved Pontons should be equipped with only the very best, highest quality, and highest mileage tire. Put a cheapie on a Ponton, and a cabrio at that? Simply not to be done! I thought this through further. Tires become tiredpun intendedbecause either they wear out treadwise or they rot and deteriorate because of age and exposure. Most of us, me included, are unlikely to drive our Pontons enough miles to warrant a high-mileage tire. They will degrade to dangerousness long before the tread wears out. I concluded I did not need a high-mileage tire with its associated cost. Did I need a high-speed safety-type tire? Unlikely at the leisurely speed and intensity my Ponton goes. So I concluded I did not need to pay a premium for such a tire. All this compelled me at the time to look closely at the now-discontinued 185/80R13 Sears Guardsman III tire. It is no longer available, but I discuss it to demonstrate the methodology I used at the time. It had temperature and traction grades of average and 35,000 miles tread wear. It was cheap. I could buy five for a total of $83.00 plus tax, mounting, and balancing. I tolerated its half-inch-wide white wall. How did the Sears Guardsman IIIs actual measurements correspond to the published data? When mounted on the rim and inflated but off the car, the calculated RpM figure was 811. Adding three percent for the tread squirm factor resulted in an adjusted RpM figure of 835virtually identical to the 834 RpM of the original 6.70 tire. There was an unexpected bonus. Mounted and inflated, the Guardsman III measured exactly 181 mm (7.13 in.) at the section width. It slipped into the spare tire well easily, with room to spare (pun noted). Yet another bonus turned up serendipitously. The aspect of the Guardsman III calculated to 83. Thus it is identical to the original 6.70-13 tires aspect. I had bought a tire in the 185/80R13 nominal size category. By both measurement and calculation it is truly size 181/83R13. One can easily use this same methodology to determine the approximate real RpM of any tire. Firestone, for example, still supplies the 185/80R13 and 175/80R13 tire in its FR-380 series, and their data are available on the web. Hankook and Kumho also make tires in these sizes. One needs to check around for others. The 220S in the black and white photos is not my cabrio. Nevertheless the picture shows one that contrasts the thin white walls found on modern radials with the wider white walls currently available on very expensive specialty tires, discussed below. It comes down to a matter of preference tempered by price. One curiosity by todays comparisons: The Taylor book refers to the wider of the two white walls depicted above as a narrow-band whitewall. Because I own a 220S, the original 6.70-13 tire size was my reference point. I proceeded from the assumption that the modern 185/80R13 radial was likely the most appropriate. Generally that proved to be satisfactory, especially when I came to realize that this size designation is only a general category. It is not a precise standard. What about the size 175/80R13? It may be even more commonly available than the 185/80R13 size. Theoretically, the 175-mm section width equates to 6.9 inches, and this is a category maximum. My experience with other tires suggests that tires in the 175-mm category will in fact have section widths slightly less than 175 mm. That proved to be true. I had access to a 175R/80R13 tire (cannot recall brand) mounted on a Ponton wheel rim. I measured its circumference and section width using the same instruments as above. Its measurements calculated to 839 static RpM. Add three percent for the squrm factor to reach the real 864 RpM. This is close to the 857 RpM of the original 6.40-13 tire. The section width measured 6.625 inches or slightly above 168 mm. This leads to a calculated aspect of about 83. To confirm this measurement I had checked the Sears website for the now-discontinued Guardsman III tire in the 170/80R13 size. With the squirm factor accommodated, the real RpM was about 865. Again, compare that to the original 857 dynamic RpM of the 6.40-13 Ponton tire fitted to the 180, 190, and 219 Pontons. I had to conclude that, according to the methodology I used, the 175/80R13 tire size is generally as goodor slightly bettera substitute for the 6.40-13 tire than the 185/80R13 tire category. The deviation from the true 857 RpM is about between 1.0 and 1.5 percent, depending on tire brand. Recall that I forewent my wish for wide white walls. My search unearthed only a few wide white wall tubeless radial tires in the 13-inch wheel size. They are all very expensive, and you will require four or five. From time to time Mercedes-Benz offers a 6.40-7.00SR13 tire for Pontons. When available, it is Mercedes-Benz part number Q-4-40-101b. It is made in Europe by Continental, apparently in batches on order by Mercedes-Benz. Some kind of exclusive arrangement must exist. My resourceful tire supplier tried every avenue to obtain this tire from Continental sources but was unsuccessful. I was not able to obtain any technical data. I saw them on a 190SL, and they looked good. Diamond Back Classics offers radial tires in Ponton-relevant sizes. See: http://www.widewhitewalltires.com/widewhite.htm One can do his own calculations of true section width, RpM, and aspect from the published data. As seen above, though, keep in mind that these may differ somewhat from the results derived from physical measurements. Also, Coker is offering a BF Goodrich radial tubeless tires suitable for all some Pontons. See: http://store.coker.com/13-quot-tire-sizes.html Both the 175 and 185 sizes are offered. Again, the calculations and measurements can be made by anyone interested to arrive at approximate RpM. If you absolutely, positively must have what today passes for tubeless wide white wall radials, be prepared to pay heavily. They begin at upwards of $160 each plus shipping, tax, and mounting/balancing. Something akin to originality is the Michelin Vintage X-stop 725R13 tire available in the United States only through Coker Tire. It is a radial but requires a tube at additional cost. Expect to be financially eviscerated for four or five tires. See Cokers catalogue. One can make the necessary RpM and aspect calculations from Cokers data table. It is stated to be the same diameterheightas the original 6.40-15 tire discussed above; that is, 1.5 to 2-plus inches taller than the standard 13-inch Ponton tire fitment. The 190 Service Manual indicates that a tubeless tire option was available as original fitment. Apparently this was not a radial. The manual provides no further discussion or data. There is no indication that a different wheel rim was required. Frequently one encounters strong advice that, when converting from original-type bias-ply tires to modern tubeless radials, a special tube is needed. That adds significantly to cost. Did I need to use a tube when putting modern radials on my original Ponton wheel rims? I thought about that. Recalling that tubeless tires were an original option without requiring a rim change, I decided to mount the new radials to the wheels without a tube. My rims were undamaged as well. So far, so good. No loss of air pressure. No signs of slow leaks at the bead. Although precision is ideal, many variables exist. One may exacerbate another. One may mitigate or offset another. Individual physical examination is necessary. One may exacerbate another. Another may mitigate or offset. Individual examination is necessary. Many considerations come into play. For a partial discussion, see Annex 1 below. The 185 section width in the modern size 185/80R13 size is a maximum. Tires in this category often measure less at the section. I found tires physically measuring 181 and 184. Doubtless, there are others. The 80 aspect is also nominal. It is fact a minimum for the category. I found tires physically measuring 82 and 83 aspect. A tire in a size category may well physically measure differently from the category nominal. Different tire lines from the same manufacturer in the same nominal size category may have different physical measurements one from another. Tires from different manufactures within the same nominal size category are likely physically to measure differently one from another. For the 6.70 original tire a modern 185/80R13 provides RpM very close to the original. The modern sizes 175/80R13 and 185/80R13 are essentially equally suitable for the original 6.40-13 tire. Both sizes provide tires wider than the originals. There is no holy grail. There are too many dependent and independent variable at play. The only way to be certain of tire data is to take physical measurements and then adjust for the squirm factor. Then you will have to test the results in a measured mile run for the odometer and against a stop watch for the speedometer. If you do not like the results, trash the new tires and buy others! Mercedes-Benz supplied various brand tires originally. They doubtless were not identical with one another and also not necessarily precisely to the norms stated in the Service Manual and the TDM. One production run by the same manufacturer may have been different from a subsequent one. Presumably new tires are used when making the technical measurements. This means a tread depth of generally (not always)10/32 inches. Double that for each side of the tire and it comes to 5/8 inch or 16 mm. As the tire wears, the RpM figure changes. Speedometer and odometer accuracy is thus affected too. Cross-ply and bias-ply tires expand when in motion and hot, at least to some degree. Review the several dynamic radius figures in the 190 Service Manual. At each higher speed increment this radius increases about two percent. Where is the reference point for comparison set? How does this compare with the data for modern tire manufacturers which, in turn, may not be directly comparable one with another? When hot, modern radials expand very little compared to cold. How, though, does expansion due to centrifugal forces compare, radial vis-a-vis crossplies? My suspicion is that it is nothing like crossplies. Several different speedometers/odometers were fitted to Pontons. Cars with Hydrak transmissions  received a different one from their non-Hydrak counterparts. On some cars different rear differential ratios were offered, and these required different speedometers/odometers. There were mile and kilometer versions. Cars originally with 15-inch tires got a still different speedometer/odometer. (I do not know about the rare 14-inch option.) These all had to be calibrated to the RpM norm of the available tires. For a full understanding of the variety of speedometers/odometers offered, the spare parts catalogues published by the German Mercedes-Benz Club provide a detailed list. Speedometers/odometers are notoriously inaccurate and inconsistent when new. Mercedes-Benz was no exception. One report, for example, suggests that 190SL speedometers/odometers had on average five-percent deviation from true. Glenns Mercedes-Benz Tune-up and Repair Guide cites Road and Track magazine reports indicating significant, different deviations for several vintage Mercedes-Benz when new. Many decades have passed since Pontons were new. Some may now have replacement speedometers/odometers. If yours was replaced, can you be certain it was the correct one per the original fitment? What if your car was converted from Hydrak to non-Hydrak, as many were? Was the instrument cluster also changed at the same time? Over time speedometers/odometers can wear and change readings vis--vis new. The problem is that the speedometer may not change commensurately with the odometers change from original. Inside the instrument cluster the drive mechanism for the speedometer is different from that for the odometer. It is quite possible for an original Ponton speedometer today to register too fast at the same time the odometer registers too slowwhen both are derived from the same RpM of the tires. Both can measure too fast or too slow but by different amounts. Measured mile and time readings can demonstrate this. So, which do you want: an accurate speedometer reading or an accurate odometer reading? You may be faced with having to choose when determining which modern tire RpM is appropriate for you. All this is why rallies start with a measured section to calibrate each car. Some Pontons received 4.5-inch wheel rims originally. Others got 5.0-inch rims. The difference is 0.5 inch. Both sizes were available on all Pontons except the 220a, 220S, and 220SE, depending on the tire. Refer to section 40-0/2 of the 180-220SE Service Manual for specifics. Which wheel rim you have can affect the aspect ratio. It is generally accepted that for every 0.5 inch of wheel rim width change the section width will change 0.2 inches (or 5 mm). If so, this suggests that a radial tire on a 4.5-inch Ponton rim will measure about five mm. narrower than the same tire on a 5.0-inch rim. One final variable for your consideration! Web page links are valid as of this writing. If they become invalid, a web search engine should recover what you need. Thanks go to Walter Yin and Scott Gordon for critical review along the way. Their suggestions were very helpful and their time much appreciated. Mistakes are mine, not theirs. Jeff Miller, editor/publisher of www.mbzponton.org, suffered through the usual agonies in preparing the article for presentation. He has my fullest appreciation. The usual disclaimers apply. Use at your own risk. 1 in. = 25.4 mm. 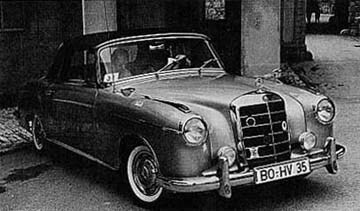 This happened after the end of the 220S sedan, coupe, and cabrio production in late 1959 (when all 220S Ponton production ceased) and after the end of the 220SE coupe and cabrio production in 1960. (Production of 220SE sedans ended in late 1959 as well.) We know this because data cards for these Pontons specify the 6.70-13 tire. π = pi = 3.1416. I have concluded that this figure encompasses what is called the tread squirm factor discussed in section IX. below with reference to modern radials. This is because of the dynamic basis of the measurement. Doubtless there were some variations in the field. Mercedes-Benz would fit originally tires by different manufacturers. See page 287 (Group 40, Disc Wheels and Tire Size) of the 1960 TDM reprint. Henry Magno (a restorer in Massachusetts ) provided the likely answer. The original TDM was a collection of loose leaf pages in a binder. From time to time Mercedes-Benz issued updates and corrections. Apparently the page in question got such a replacement sheet that stated the 7.25-13 substitution. When the TDM was reprinted, this page, being the most recent version, became the final one. Here I have to confess that I did not search for a standard definition of what constitutes a 13-inch wheel. Is it measured across the hole in the tire? Is it measured from a specific point on the wheel rim? I punted and simply used a flat 13 inches as the figure for calculation. Anomalies here could affect the calculations. From everything I could find I conclude that the section width of the original tires was exactly as stated. The 6.40-13 tire had a section width of exactly 6.4 inches. The 6.70-13 tire had a section width of exactly 6.7 inches. The 7.25-13 tire presumably had a section width of exactly 7.25 inches, but I cannot be certain of that. That assumption, of course, is open to question. Note the comment above that no Mercedes-Benz data was available on the historical norms for this tire. I make this assumption because Mercedes-Benz did not change the speedometer/odometer to accommodate the standardization change in the tire size. A change in gear ratios in the differential, the transmission, or the speedometer cable drive gears could have accommodated the different tire size, but I found no indication of this. 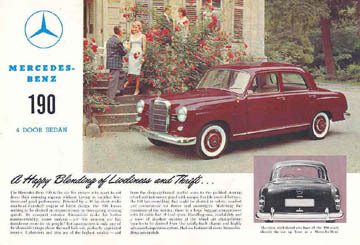 The photo of the red 190b sedan is a factory sales brochure. The black and white photo was taken from James Taylor, Mercedes-Benz since 1945, (Vol. 1), Motor Racing Publications, Ltd., London, 1991. The 175/80R13 tire lists 868 RpM. The 185/80R13 tire shows 843 RpM. 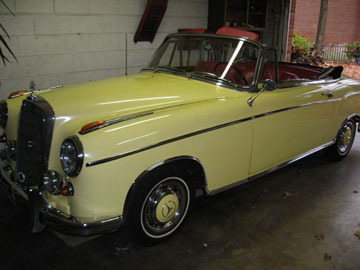 This is my Mercedes-Benz Type 220S Ponton cabriolet. Michelin in Europe informed to me that this tire is marketed in the United States only through Coker. Until 2005 Michelin produced a tire size 185R13. Its aspect, according to the literature, was 83. Hydraks were a sort of semiautomatic transmission supplied to some six-cylinder Pontons and other cars of the 1950s and 1960s. I do not know why they required a different speedometer/odometer from their non-Hydrak counterpart. I got this from a website that I can no longer find. It seems reasonable, so I leave it for your consideration.